I've long advocated SVG icon systems. Still do. To name a few benefits: vector-based icons look great in a high pixel density world, SVG offers lots of design control, and they are predictable and performant. I've also often advocated for a SVG icon system that is based on <symbol>s (an "SVG sprite") and the <use> element for placing them. I've changed my mind a little. I don't think that is a bad way to go, really, but there is certainly a simpler (and perhaps a little better) way to go. Just include the icons inline. That's it. Sorry if you were hoping for something fancier. Putting right into markup is a pretty  icon system. You need no fancy tooling to make this work. Your folder full of SVG icons remain a folder full of SVG icons. You'll probably want to optimize them, but that's about it. SVG icons included as a <use> reference have a shadow DOM boundary. That's not going to work. You'd be targeting the path in the <symbol>, which doesn't really do anything, and the click handler is kinda lost in the cloning. You'd have to attach a handler like that to the parent <svg>, like #play-button. Will not select anything, as there is a Shadow DOM boundary between those two things. When you just drop inline SVG right into place, there is no Shadow DOM boundary. With a <use>/<symbol> system, you have this SVG sprite that is likely included on every page, whether or not they are all used on any given page or not. When you just include inline SVG, the only icons on the page are the ones you are actually using. I listed that as an advantage, but it sorta could go either way. To be fair, it's possible to cache an SVG sprite (e.g. Ajax for it and inject onto page), which could be pretty efficient. That is, link to the icon via a relative file path. The only way it works in Microsoft land is to reference an ID to SVG on the same page. There are work around's for this, such as Ajaxing for the sprite and dumping it onto the page, or libraries like SVG for Everybody that detects browser support and Ajaxs for the bit of SVG it needs and injects it if necessary. Dumping the sprite into the HTML server-side. I find myself doing #2 more often, because #1 ends up with async loading icons and that feels janky. But going with #2 means "bloated" HTML cache, meaning that you have this sprite being cached over and over and over on each unique HTML page, which isn't very efficient. The same can be said for directly inlining SVG. Conclusion and TLDR: Because of the simplicity, advantages, and only minor downsides, I suspect directly inlining SVG icons will become the most popular way of handling an SVG icon system. One (somewhat surprising to me) downside of this approach that we found if you’re rendering your page with React: if you have a lot of icons on your page, the extra work it takes for React to render out all of the individual elements inside an icon can add some noticeable load time over having a <use> tag. If you’re using React (and/or friends) does directly inlining basically become the same as dropping a big ol’ <symbol> chunk into your html? You kinda just end up with a sprite that lives in a js bundle instead. Am I supposed to be splitting icons into separate bundles? Has this problem been around long enough that there’s a RightWay™ to handle it? Is it not enough overhead that it’s an issue? I’m not sure what React / JS framework has to do with it, but basically the differences outlined in the article are relevant regardless of the framework. The best way to approach SVG’s has always centered around your use case. There’s no “right way”, because various approaches have their pros and cons. For instance, on the site I’m working on now, I need to be able to animate the paths of my SVG. If I was using an externally referenced ‘ myfile.svg#foo’ approach, I could take advantage of caching across pages but would limit my ability to animate the paths within that (Shadow DOM issues). To properly answer your question, you’d need to evaluate all the different SVG approaches, and what your needs are. I inline a sprite on first load, but also park it in localStorage and inline it from there for subsequent pages using inline script. No noticeable jank. Can you expand on this technique? If you’re making a button with an SVG icon, the image should be inside a <button> anyway, regardless of how you’re displaying it. You can, but I would argue that the SVG — whether you’re displaying it by inline or background image — should be its own element, inside the button element. I view it as separation of style and functionality. Any good solutions for angular2 basehref issue with svg use # href ? One example of a current standard is a short html snippet (like <i>) with a class name (like <i></i>). How is inlining better than just using ? I keep all icons in one XML-file which become php-variables on every page by simpleXML where I echo the variables them inline. This way an icon can be replaced by text, a comment or emptiness. It’s like in the Sovietunion, only with icons instead of humans—and with XML! I’m not ready to answer to that yet, but it sounds ok! This is a non – issue. I have been using SVG icons extensively for years. 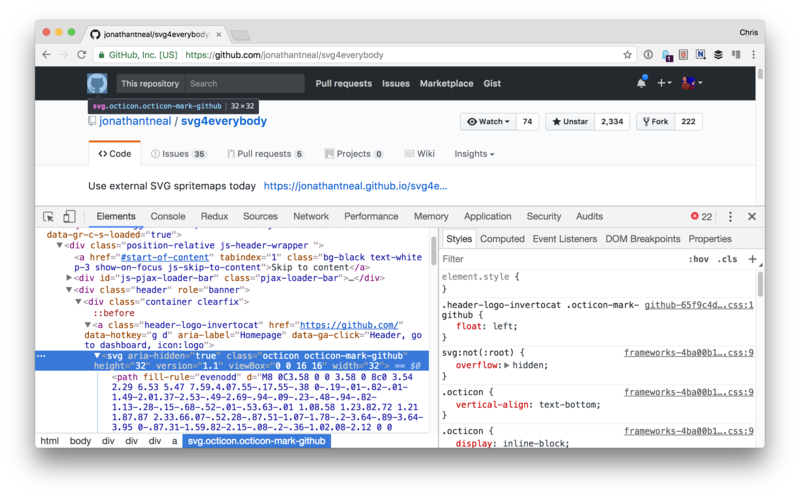 Just use <img> tags, specify viewBox attribute in SVG file /tag to mitigate browser compatibility issues, and make sure the correct mediaType is being served in the HTTP response headers! That makes every icon a separate HTTP Request, and that’s usually thought of as pretty bad for performance. That means you have much less design and scripting control over individual icons. But if those things aren’t of concern, yep, that’s even easier. I’ve tried a few different methods regarding SVG Icons, and I always seem to come back to using the <img> tag as well when I know that there won’t be any scripting needed. Each icon may initially require a separate HTTP Request, but that can be a positive if the icon is used globally and the browser caches the SVG image file. Wouldn’t multiple requests be a non issue if your server is configured with http2 ? You can not change the appearance of an svg as an tag. Using external recource with SVG is supported by Edge 13 and newer (https://developer.microsoft.com/en-us/microsoft-edge/platform/changelog/desktop/10547/). There’s another polyfill which doesn’t use browser sniffing: https://github.com/Keyamoon/svgxuse. This is what I have been using recently, and it works pretty well IE. There is some delay until the icons come into place, but I think that’s acceptable. I’ve been using this approach in my current project. So I do this in a hybrid-mobile app using the Rhodes framework. There is a Rails(-like) server in the app and ERB (I know… I find ERB painful too, but it’s what is available) templates. The icons are saved from Illustrator with entity styles, so you can easily override with CSS. Layers are named semantically, so you get semantic IDs. A simple pre-build workflow changes id= to class= in the SVGs. So, now, I can change colors, animate, whatever using semantic CSS class names. The .svg files get renamed to _whatever.svg.erb and placed in a directory accessible to the template engine. So, now each icon is an ERB partial. Yes, with hand-editing (or a workflow) I can include partials or other ERB markup inside the icons. I actually do this currently on one icon, which is a static circular progress bar. (Static because progress would never change while viewing the page with the icon.) progress_percent is passed-in to the partial as a local. I have plans to do i18n of text inside the SVGs. Each phrase is placed on a layer, and the layer given a meaningful name that can be used to look-up the translation from a table. The same pre-build workflow can be used to replace the content of specially-marked <text> elements with e.g. <%= t :t_submit_btn_lbl %> (where t is my translation helper). Template render time is a non-issue in this particular environment, as the templates are compiled to Ruby and then the Ruby compiled to Ruby bytecode at build time. At run time it is just executing Ruby bytecode and once a file is loaded it stays loaded. […]5000 SVG symbols using use against directly creating the SVG symbol’s shapes[…] It turns out that rendering SVG shapes using use was almost 50% slower. Yeah I’ve been doing this for quite some time. Big fan of this solution. I still prefer the SVG sprite inlined inside the CSS to be used either explicitly with <i class="[size] [color] [type] icon">[Fallback]</i>. The only disadvantage compared to putting the SVG into the HTML is that you need an extra statement per color. Being able to reuse icons without adding more size to your page is definitely an advantage. Not sure if it could be considered the best method in terms of performance, but after many different approaches I have landed on what I think is my preferred implementation when using React: each icon is simply defined as an inline within its own component. It makes using and updating icons really simple and doesn’t sacrifice any SVG functionality. Plus it makes extending the functionality with react really simple (for instance, I have a file placeholder icon with a text element that changes based on the filetype, which I simply pass in via a prop). I am using all my svg’s as inline where i need them from an php function call. But what about clipping? You need IDs for the clipPath. And if you place an svg icon multiple times, you have to change all clipping IDs. Do you know a better way? Can’ t it be a problem when you have a somewhat complex svg symbol that is used a lot on a page? For instance, I have a list of articles, all displayed with a little icon before the title to “categorize” the article. If I inline the svg images for each article, my html file will be huge. Is it a valid issue to stay on the USE system ? This is my main question as well. In my situation, my file size would explode exponentially by inlining all the icons, it’s simply not a one-size-fits all approach. The solution that inlining seems to solve is to allow control over the SVGs. But if you don’t care to do that, then SVGs as backgrounds, or as ::after/::before inserts, etc… (every other system) work just fine, or even better than inline SVG. To state emphatically inline SVG is the best way is to ignore many use cases where it’s literally the worst way. Exactly during the last month, I started to acquire a better understanding of the best way to manage icons and images for my personal blog. In particular I learnt that, with HTTP2, things like image sprits will no longer be necessary. We mostly use a two tier approach. To achieve this multilingual/accessible text another way might be to use multiple svg files e.g. svg-en.svg, svg-fr.svg for multiple languages? But using <switch> seems less easy to maintain than keeping it in the CMS? For individual and or less used single SVG images, maybe illustrations or some such, we may load them via an include and inline them that way. We’d probably use a language switch in this case. Does anybody have any thoughts or comments on this approach? It also strikes me that it might be possible to include/inline the SVG file at first launch but then store it with a service worker and pull it back from the cache in the future? Not sure if this has any benefits though. This is the approach we have been using in production. It’s easy to style and animate. Seems cool :) but I often need svg as a background image, how about those, make a sprite for now?